There’s nothing better than a hot breakfast, but waking up early to make it happen before the kids go to school isn’t always feasible. We end up having a lot of cold cereal and toasted bagels, unless I put a little extra effort into planning. I’m a huge fan of freezer cooking, and freezer meals don’t just mean dinner or the crock pot. There are tons of great breakfast freezer meals to save you time during the week, too! Here’s a few things you can do before preparing your meals that will set you up for freezer success. 1.) Clean that freezer out: You know what I’m talking about– the freezer burnt half used items just taking up space in the bottom of your freezer. (Hopefully, that’s not just me?!) Now is a good time to take stock of what is in your freezer and decide what needs to go, and what can be re-arranged. 2.) Hit the Dollar Store: When I’m preparing items for the freezer I like to have paper towels, freezer bags, foil, and tin pans on hand. Take note of what you need, and hit the dollar store! 3. 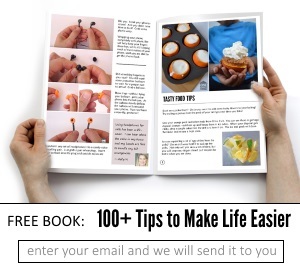 )Maximize your time: If you are making a batch of muffins, it’s just as easy to quadruple the recipe you are making, if you have room in the freezer. Consider making more to maximize your time. 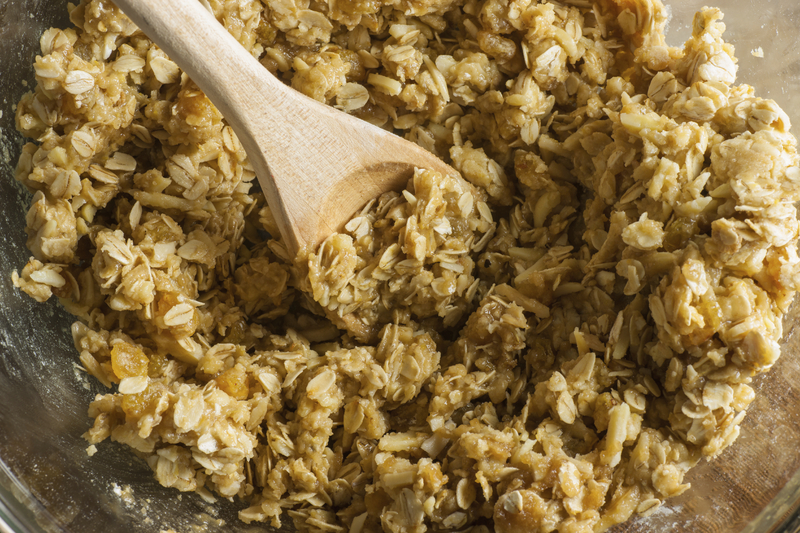 Take a quick note of what dry ingredients are in your pantry. I buy flour and sugar in bulk so this usually is not a problem. Baked Goods: There are tons of baked goods that freeze well, most muffins, waffles, breads and even pancakes will do great in the freezer. If you are making a batch of pancakes on a Saturday morning, consider making a few extra for the freezer. This is a simple way to fill your freezer without feeling like you put in a lot of extra work. Any time I bake something, I make enough for the freezer too! Here’s a couple of favorites at my crazy house. Preheat oven to 375F. Separate dough into 16 biscuits. With a knife, carefully cut each biscuit into 2 layers. Watch those fingers! This can be tricky. Your should have 32 rounds. Over medium-high heat, cook the sausage in a large skillet until no longer pink. Drain fat and add onion, garlic, paprika, and thyme. Season with salt and pepper. Continue cooking until onion is softened. Remove from pan and add eggs to pan. Scramble eggs, but under cook them just a bit. Season with salt and pepper. Remove from heat and add in meat. Stir in cheese. Spray a muffin tin with nonstick cooking spray. Gently press 16 dough rounds into the bottom of the pan and then halfway up side of cups. Spoon ¼-1/3 cup of egg/meat mixture on top of the rounds. Top each with a dough round and gently tuck the dough edge into muffin cup. Brush top of biscuit with melted butter and top with a little more cheese (or alot!). Bake 16 – 20 minutes or until deep golden brown. Remove biscuits from muffin cups and place on a cooling rack. Let them cool completely before adding them to your freezer bags. Mix together ingredients and cook in your waffle iron until good and crisp. Let cool them cool completely before adding to freezer bags. 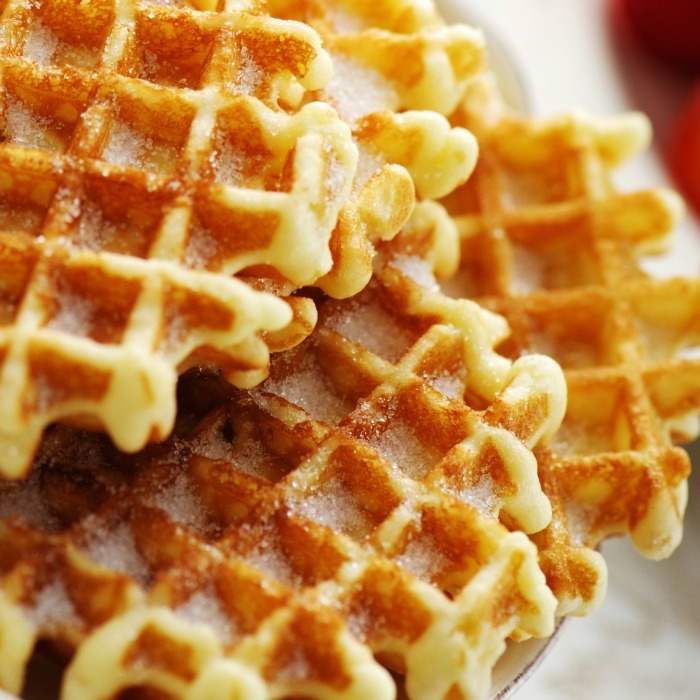 To thaw: Pull desired number of waffles out of the freezer and heat in the microwave, in a toaster oven, or in the oven. I like to put them on a cookie sheet in the oven to reheat. 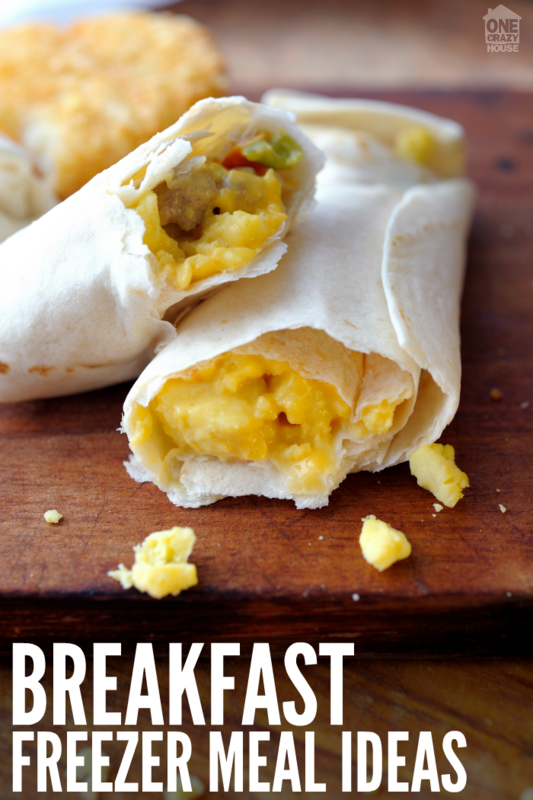 Breakfast Burritos: My kids love to swing into McD’s for a breakfast burrito. This is SO easy to duplicate at home, and they taste even better! Beat eggs, sugar and butter together. Mix in the rest of the dry ingredients except for the oats. Stir in milk and oats. Pour into a greased 9×13 foil pan or baking dish and cover well. I recommend covering with a Ziploc freezer bag. Freeze. Let it thaw in the fridge the night before you want to make it. Pull it out of the fridge in the morning and bake for 35-45 minutes at 350. Yum! Serve with fresh berries or other fruits. There are so many great options for breakfasts that freeze well, but again one of the easiest ways to stock the freezer is to double recipes as you cook and make some to consume now, and some for the freezer. Give it a try sometime! Looking for more easy breakfast ideas? Check out 15 Ridiculously Tasty Breakfast Quesadillas or 21 Make Ahead Breakfast Ideas.